Height 5 feet 6½ inches. Weight 136 lbs. Chest measurement 34-36 inches. Complexion dark. Eyes brown. Hair brown. Eyes both 6/6. Hearing and colour vision both good. Limbs well formed. Full and perfect movement of joints. Chest well formed. Heart and lungs normal. No illnesses. Free from hernia, varicocele, varicose veins, haemorrhoids, inveterate or contagious skin disease. Vaccinations. Good bodily and mental health. No slight defects. No fits. Fit. Edwin Herbert DANIEL was the son of Edwin Herbert DANIEL and Helen née DUNLOP. of Kingsdown. He was the third son of the family to volunteer for active service. 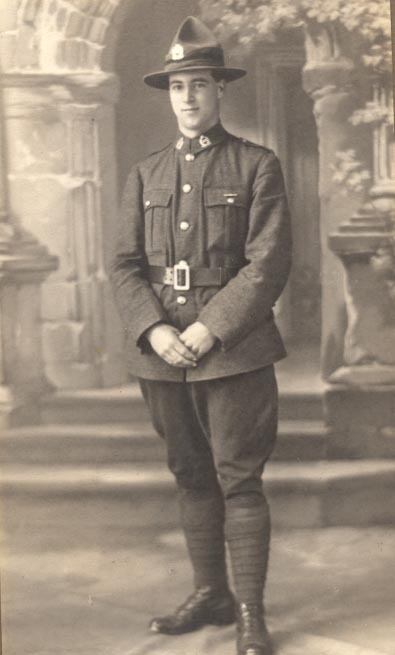 Although he gave his age as 20 years, Edwin was, in fact, only 18 years old when he enlisted. His oldest brother was killed at Gallipoli. And another older brother, Lynton, also served.